Guitarist and composer Don Pride has an extensive performance background and is noted for being able to play in a wide variety of styles. 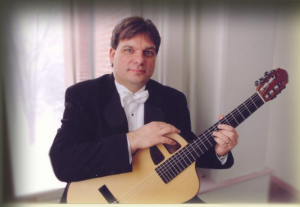 As a classical guitarist, he has presented concerts and recitals throughout the United States. He has played with both the Portland Symphony Orchestra and the Chelsea Symphony from New York City. As a jazz guitarist, Don is a member of the Portland Jazz Orchestra, leads The Don Pride Quartet. Don also leads of The Don Pride Band, a musical organization that has played numerous concerts, functions and festivals over its over 20-year history. Don also plays guitar, sings, and writes arrangements for the eight-piece Carmine Band, formerly the Tony Boffa Band. He has also freelanced with many people including Mark Tipton; the Zapion Middle-Eastern Ensemble; Tracy Ullman; and African Gospel Artist Fiston Bujambi. Don recently played lead guitar for the African Gospel Awards show in Atlanta, GA. He has been a featured solo performer for American Cruise Lines since 2013 and has played all over America. He has released two albums under his own name and has appeared on several recordings by others, including most recently Mark Tipton and the Portland Jazz Orchestra.